Welcome to my online resource page. If you have any questions about what you see here, please call 660-646-8000, Ext. 205. April 2018 - Adam Warren, who is completing his second term as the county's elected prosecuting attorney, currently maintains a private practice in addition to handling the county's prosecutorial duties. In 2017, a new criminal code was passed regarding every single criminal law, noting that the laws were recodified and some of them had changed. The statute requires a full-time prosecutor to do some officer training every year. By making the office a full-time position, the salary will increase from its current $73,825 to $137,745 per year. Prosecuting Attorney News: Adam Warren, Chillicothe's prosecuting attorney and Livingston County's elected prosecuting attorney, has remodeled his private practice located downtown at 711 Washington Street. The building underwent an interior and exterior renovation in 2014. Pictured at left is Adam Warren who opened his practice at this location in 2006 and began remodeling the building shortly thereafter. The remodel, which was completed in December, 2014, includes the addition of a balcony overlooking Washington Street. 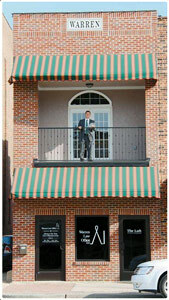 The law office is located on the main floor, and the upstairs will be rented as an apartment. CT Photo by Brittany Tutt 01/21/15. News 12/13/18 - The Livingston County Prosecuting Attorney will handle Prosecution services for the City of Chillicothe. The Chillicothe City Council approved the contract with Prosecuting Attorney Adam Warren at their meeting Monday, December 10, 2018. Under the contract, the City pays Livingston County $30,000 a year plus expenses. This contract begins January 1, 2019.